The following was read by announcer Peter Fenton at the opening of the Saturday night session at the UPHA American Royal. Ladies and gentlemen, this week we have been following the story of I’m W.O. Bentley, our flag horse, and his rescue from the feedlot seven years ago by owner Kathie Dunn. Tonight, we are going to share another chapter in “Nickers” story as well as share a special ride with a very special man. 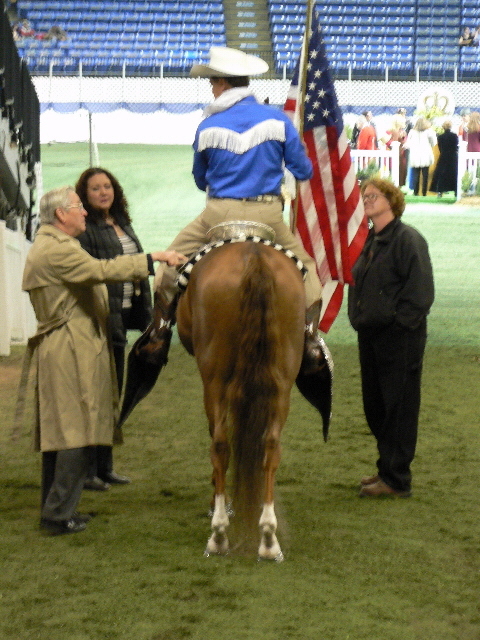 Mr. Bob Ruxer is well-known within the Saddlebred community. Bob has been our UPHA president and vice president. He’s been UPHA Horseman of the Year and was inducted into the Tom Moore Trainer’s Hall of Fame. His first horse was WC Magic Supreme. He has bred and raised such stars as WGC Starina, WC Tropicana Rose, WC Sultan’s Wild Cherry, WC Sultan’s Supremacy, WC Magic Marvel, WC Lover’s Eyes, WC King of Siam, CH Candle Dance, WC Whiffenpoof, WC Mr. Snuffleupagus, WC Sultan’s Sweet Lorraine, and reigning WGC Manilla Thrilla. Not so well known as these is a horse he also bred – House Buster. House Buster was sold out of the field as a yearling and his name was subsequently changed to “I’m W.O. Bentley,” the horse you see tonight with Bob. Bob also wrote a wonderful book entitled “The Silver Saddle.” Upon reading the book and learning of a six-year-old’s dream to someday take a ride in the Silver Saddle, Kathie immediately offered her American Royal stake-night silver-saddle ride to the little boy all-grown-up who bred her beloved Nickers – Mr. Bob Ruxer. Please welcome “Buster” and his breeder, Mr. Bob Ruxer, to our ring tonight for the presentation of the National Anthem. And now Bob, there’s one more thing we’d like to wish you – and that’s a very, very Happy Birthday – yes, folks, tonight is Bob’s birthday. Please join me in wishing this consummate horseman and ultimate gentleman a very happy ride through life! Editor’s Note: While attending the ASHA convention in February, 2005, Kathie Dunn had the opportunity to acquire Bob Ruxer’s book The Silver Saddle and meet Ruxer in person. She had an immediate brainstorm. The plans were already underway for Dunn and I’m W.O. 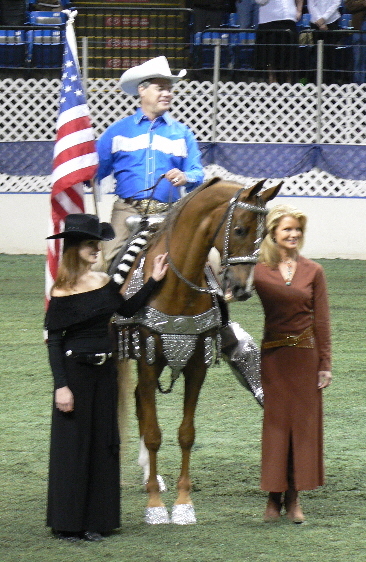 Bentley to participate in opening ceremonies at the 2005 American Royal. She owned a complete vintage silver parade set that she frequently used in California. What could be more perfect than for Ruxer to get that ride on a silver saddle… and on a horse he’d bred! While initially reluctant to take that ride, Ruxer finally agreed with the encouragement from friends and wife Laura. And of course, Dunn can be quite persuasive and persistent when she sets her mind to something. To make the experience even more authentic, Ruxer special-ordered genuine Roy Rogers attire. 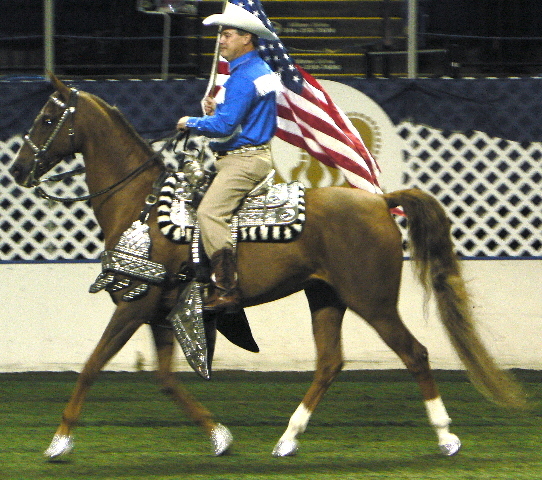 To complete the look, Dunn loaned him a huge, ornate belt buckle won by “Nickers” as the best equine entry in a California parade.